Old Venus starts with an intro by Gardner Dozoi where he gives a hit of a history lesson about the field of science fiction. He explains that the reason why the old pulp stories are scientifically inaccurate is not because the authors just made a bunch of stuff up, but because the scientific theories of the time were vastly different from those of today. I will have to verify this by comparing the old scientific theories with the books published around the same time—possibly a topic for future post—but this is huge if true, and it completely destroys the Hard SF vs Soft SF debate. However, there is one comment that really ruins the essay, and for some at least, it might ruin the whole book. So, yeah, the book starts off by telling fans of Planetary Romance that they’re not real Science Fiction fans; real Science Fiction fans scoff at that sort of story-telling. Pulp readers don’t have to be your audience anymore; pulp readers are over! This is a terrible way to start off the book, and it sets a poor tone of the collection going forward. The story begins with a shuttle touching down on the ocean planet of Venus, much to the discomfort of its passengers. One of these passengers is Ronson, a Personal Investigator searching for some rich kid who went missing during a vacation trip to the planet. The police haven’t seen him, and they think that the kid might’ve been abducted and forced to work as a yak harvester. 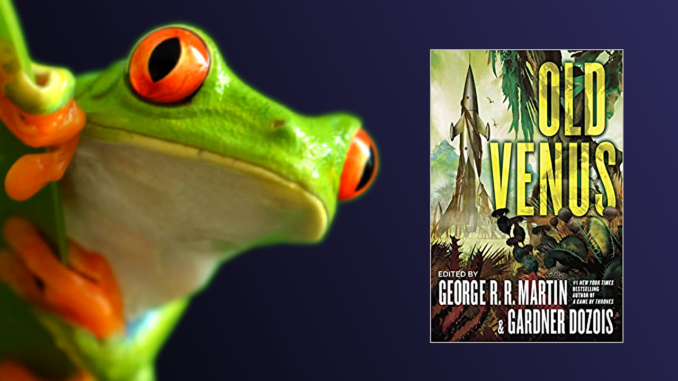 The biggest problem with Frogheads is that the events of the story are presented in a manner that is too mundane. There’s a scene early on where Ronson is taken to the police for trying to bring a gun onto the planet, and it’s treated as just a minor inconvenience for him. He knew that guns were outlawed on Venus, but he wasn’t at all worried about getting caught with the weapon. This would’ve been a perfect opportunity to show a very tense scene where he tries to sneak the gun past the guards, only for the weapon detector machine to catch him anyway. The mundane way that everything is portrayed just makes the story somewhat of a slog to read though. The characters are traveling to another planet, but to them it’s just a boring business trip. Overall, the writing just isn’t very good, like the way that Mikhail, a side character who was one of the first to travel to Venus, is sometimes referred to as “the russian” as if just saying his name is going to wear it out somehow. Though the story does pick up a little toward the end, after Ronson finds the rich kid. For a few pages, the reader is left wondering if or when a new problem will arise to complicate their rescue operation. And, of course, something does happen to spoil their plans. However, the ending was just a big let down, because instead of a great battle, Ronson just runs below deck to hide while the carnage ensues. In the end, the whole thing was basically a waste of time, both for the characters and for the readers. At the risk of spoilers, the rescue mission was a failure. The last couple lines are just Ronson and the boat captain complaining about how much of a hellhole Venus is. There’s also an environmentalist message that comes out during parts of the story, and it felt really tacked on. It seemed as though the author just threw it in as an afterthought, like he only put it there because Sci Fi short stories are supposed to have political messages. There just wasn’t any passion behind it; the message was just sort of there, without any thought to integrating it into the story. The short intro before the story promises that this will be “a vivid pulp adventure of the old fashioned kind, full of slam-bang action…” And that’s a promise the author at least tries to deliver on. The story starts with our hero, Colt, playing a game of cards with two venusians and an Earth man, named Carter. Then another Earth man bursts into the room, half dead and being chased by a group of ant people. This leads to a big shoot out, where Carter takes a raygun blast to the face that kills him. Yes, the character who is clearly named after John Carter from A Princess of Mars dies before the opening scene even finishes. Also, Colt is apparently armed to the teeth; during this fight he pulls out a gun, a rifle, and a knife, none of which were mentioned before the battle began. After the fight is over, the dying Earth man, with his last words, tells them about a treasure, which sets Colt and the one venusian who survived the battle, Sharol, off on a treasure hunt. There’s a rather heavy-handed anti-colonialist message throughout the story. Colt and Sharol often lament about how the wonderful planet of Venus, with its swamps and forests and old temples, will someday be turned into just another Earth-like city. And none of the benefits of bringing Earth man technology are ever brought up, and it’s just assumed that the natives of Venus will have no way to adapt and will soon die out. This is all best exemplified with the story’s villain, Van Huisen, who is a greedy, capitalist warmonger who might also be insane. The narrator tells us that he committed xenocide against the “peaceful ocean-dwellers of Europa,” but without really seeing this act on the page, there wasn’t much reason to care. At the very least, the story avoids giving Huisen a tragic backstory to somehow justify his horrible actions. Van Huisen is a truly evil character, even if a mere caricature of the sort person the author hates. In the end, Van Huisen is not defeated by the hard work and perseverance of our heroes, Colt and Sharol, but instead the Sun Eater that they saved at the beginning of the story appears from the sky and saves their lives. It sacrifices its life to help them escape, but as they’re running away from the temple, the Sun Eater is reborn again and destroys Van Huisen in the process. All of this would be really disappointing, except the story up to this point wasn’t all that engaging to begin with. The writing often really awkward in such a way that it becomes much harder to be invested. The way that the story is told just isn’t exciting, so it’s just kind of boring to read, rather than a thrilling romp through the jungles of Venus.